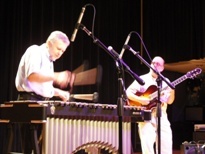 Ed Saindon (vibes) and Larry Baione (guitar) performing a concert as part of Berklee College of Music's Percussion Festival during June 2010. The concert took place at the David Friend Recital Hall at Berklee on Thursday, June 24th, 2010. Selections: Jitterbug Waltz, Sweet Lorraine, Triste, Wrap Your Troubles in Your Dreams, Autumn Leaves and All The Things You Are.